At 28, the Czech Patrik Hajek is a popular figure in the paddocks. Blessed with an endearing personality, he has been competing internationally for the past ten years in 125cc gearbox. Very often among the best, he had never before won a major title to reward his talent. He has now added his name on the list of World Karting Championships, an unforgettable event in a Driver’s career. It was a long time ago, I was eight years old. I immersed myself in the sport thanks to my father, who brought a kart home once. That’s how it all started. I first raced in the National Championships in the Czech Republic. At one point, it became too expensive for my family to continue supporting me alone. By chance I came across the Orion Racing team of Martin Slavik and Martin Doubek. They believed in me and helped me to progress in KZ2 internationally. We also narrowly missed the European title in 2009. 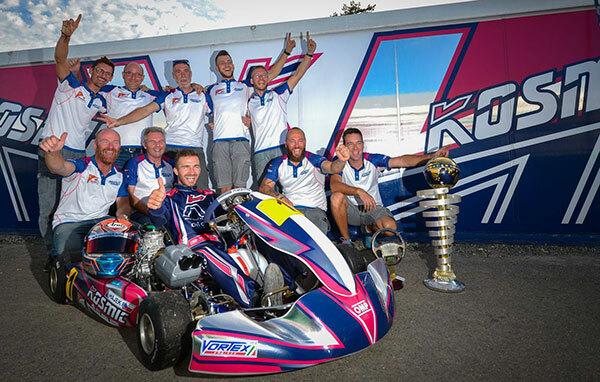 I followed this team to Praga Kart before returning to OTK from 2016 under the Kosmic colours. I did not expect to win the title this year. I had confidence in the equipment that is very powerful. After setting the 3rd fastest time in Qualifying Practice, I won three Qualifying Heats. So I started on pole position for the Final, but I remembered my misadventure, last year at Wackersdorf when I crashed with Jeremy Iglesias. Fortunately, there was no problem this time. I immediately escaped in the lead while my rivals fought with some intensity. It must be said that my team had worked very hard to further improve the behaviour of my kart after the Heats. In the Final I had the equipment to win. That’s what happened! Karting is my life. You realise, next year it will be 20 years that I’ve been in this environment. So of course, winning the World Championship is a dream that has motivated me from the beginning. Now it has become a reality and I will have to get used to it! I cannot say anything about my future at this time, because I do not know what I will do next year. I am a professional Driver and it is my employer who decides. If I continue, it will be with OTK because it’s my family. For now I am enjoying being World Champion while taking a look back on these two decades of racing. I like Karting first and foremost. It’s so exhilarating to race at the highest level of a discipline. I have never really been attracted to motorsport, besides I have never tried a racing car. Today, I do not know what tomorrow will be like.